The winter weather has me craving hearty pasta dishes. With quite a few tomatoes on hand, it was apparent that it was time for me to make some homemade pasta sauce to freeze. I decided on a pasta dish involving a bolognese sauce because of the richness of flavors and texture it has. That lead me to this recipe from Gourmet which combines bolognese with layers of spinach and bechamel sauce. The original recipe makes a full 9x12 pan of lasagna but I halved the recipe and baked my lasagna in a standard loaf pan. This prevents us from having lasagna for days on end and I like a thick & tall lasagna better than a wide & short one! Heat oil in a 12-to 14-inch heavy skillet over medium heat until it shimmers. Cook bacon, onion, carrot, celery, and garlic, stirring occasionally, until vegetables are softened, roughly 12 to 15 minutes. Add pork and cook, stirring occasionally and breaking up any lumps, until meat is no longer pink, 6 to 10 minutes. Stir in wine, milk, tomato paste, thyme, and salt & pepper to taste. Simmer, uncovered, stirring occasionally, until most of liquid has evaporated but sauce is still moist, about 1 hour. Wring spinach in a kitchen towel (not terry cloth) and twist to squeeze out as much moisture as possible. Set aside. Whisk together ricotta, eggs, parmesan, nutmeg, milk and salt & pepper to taste. Spread a couple tablespoons of bolognese sauce in loaf pan and sprinkle with 1 tablespoon parmesan. Cover with 1-2 dry noodles, leaving space in between. Spread half of ricotta filling and top with spinach; then 1 cup bolognese sauce, and top with 1 tablespoon parmesan and 1-2 noodles; repeat. Top with remaining bolognese sauce, 1 tablespoon parmesan, and remaining 1-2 noodles. Pour reserved ricotta mixture over top and sprinkle with remaining 1/4 cup parmesan. Cover pan tightly with parchment paper and foil (or just buttered foil) and bake 50 minutes. Remove foil and bake until top is browned in spots, about 15 minutes more. Let stand 15 to 30 minutes before cutting. What a great comfort food for this cold weather! Looks like an interesting version of lasagna. Yum! YUM! This looks delicious. I like the loaf pan idea. I'll have to try that! Your lasagna looks perfect! I am marking yours to try since I need to work on my lasagna making this winter. Total comfort in this bitter cold! Looks delish! What makes the top layer so nice and thick - cheese? Looks fabulous! Can I come eat some too?? The lasagna looks super! Sounds like a very hearty, comforting dish to stay warm with; I heard about the frigid conditions in Chicago (2 degrees) today...it was 80 degrees today here in San Diego! Sending warm thoughts your way! That looks like such a hearty and delicious lasagna! Mmmm! Looks like the perfect winter weather meal! That is one serious piece of lasagna!! It looks so good. I love spinach lasagna! Looks divine! while probably not the best for my waste line this looks amazing! That top layer looks so thick and delicious! 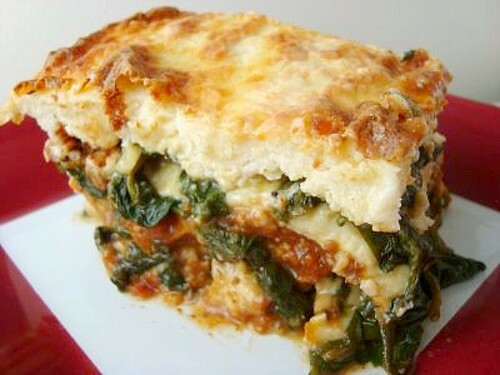 The combo of spinach and bechemel in lasagna sounds divine. I'll have to give this a shot. That's a great idea to make it in a loaf pan. I don't normally make lasagna because it just makes too many leftovers for 2 people!